Give a minute | Flickr - Photo Sharing! Orchestrated by CEOs for Cities, as part of its U.S. Initative, the pilot program launched this week in Chicago, where billboards and bus shelter ads ask a question and direct citizens to either text their answers to a number or input it online. 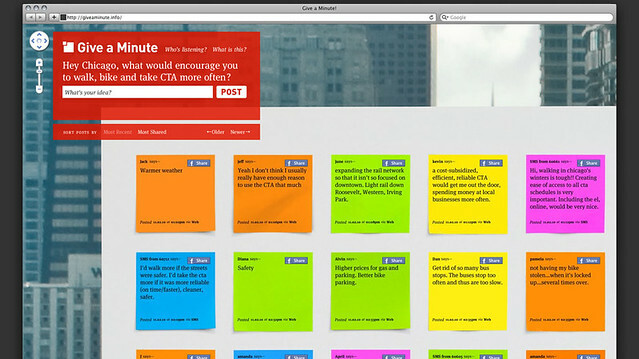 When people submit their ideas, it gets registered on a Post-it graphic that appears on the website. Here's the thing though: The best ideas get a text or email back. Beyond addressing plans to build new infrastructure on the waterfront, reform the pension system, and allow livery cabs to pick up passengers in Queens and Brooklyn, the mayor announced a new program called "Give a Minute", which is conceived as a sort of 311 for new ideas. Citizens can text their ideas to 312.380.0436 or post them to the Give a Minute website at www.giveaminute.info. These ideas will guide recommendations during the Connectivity Challenge in Chicago December 8-10. The Give a Minute for Chicago campaign was made possible through the generous support of the Chicago Transit Authority. "Hey Chicago, what would encourage you to walk, bike and take CTA more often?" That's the question on the Give a Minute site right now. 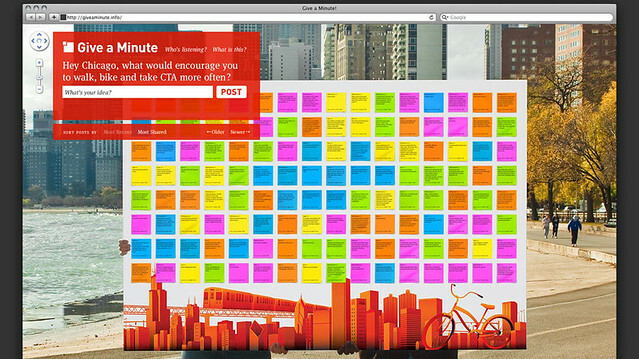 It takes all of 15 seconds to type in or text your idea, which is displayed on a Post-it note in real time: "Flowers and hot guys," "Better stations on the red line," "Heated bus stops and more routes PLEASE," "Nothing," and so on. Why contribute? The carrot is the site's promise that city officials are "listening." They will respond personally to the best suggestions. The idea is coming soon to Memphis, Tenn.; San Jose, Calif.; and New York. All it takes is a good question and an easy way to contribute to create a valuable citywide conversation. Tom Mason is a Producer, Director of Photography, and Editor based in New York City. He has worked on a wide range of broadcast documentary projects including the HBO feature documentary “Hard As Nails,” “God in Government” on PBS, and the feature length documentary “The Good Mother,” which premiered on the European channel Arté in May 2009. He has created commercial and non profit marketing videos for clients including GE Healthcare's Healthymagination campaign, the 2008 Beijing Olympic games, the New York City Penny Harvest, and Echoing Green. He has directed several documentary pieces for Newsweek.com, and is the creator of the web video series "Big Thoughts at The Bell House." He is an adjunct professor at the Columbia University Graduate School of Journalism. Resources related to issues concerning urban/innter-city children. There is a special emphasis on academic resilience among these children.